The film stars Harrison Ford, Mark Hamill, Carrie Fisher, Adam Driver, Daisy Ridley, John Boyega, Oscar Isaac, Lupita Nyong’o, Andy Serkis, Domhnall Gleeson, Anthony Daniels, Peter Mayhew and Max Von Sydow. Kathleen Kennedy, J.J. Abrams and Bryan Burk are producing with Tommy Harper and Jason McGatlin serving as executive producers. The screenplay is by J.J. Abrams & Lawrence Kasdan and Michael Arndt. 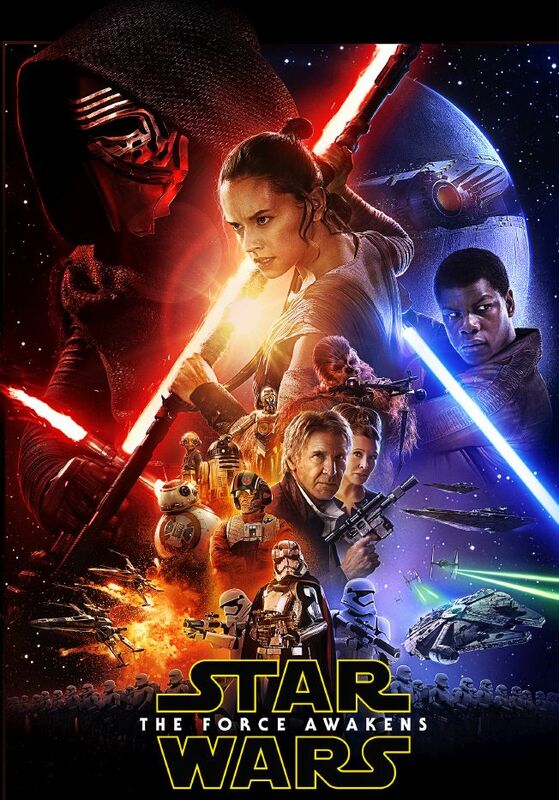 Win an exclusive Star Wars: The Force Awakens hamper! Star Wars is an American epic space opera franchise centered on a film series created by George Lucas. It depicts the adventures of various characters “a long time ago in a galaxy far, far away”, following the main story of Anakin Skywalker and his son Luke. The first film in the series, Star Wars (later subtitled Episode IV: A New Hope), was released on May 25, 1977 by 20th Century Fox and became a worldwide pop culture phenomenon. It was followed by two sequels, The Empire Strikes Back (1980) and Return of the Jedi (1983); these three films constitute the Star Wars original trilogy, and received positive reviews. A prequel trilogy was released between 1999 and 2005 and received a mixed reaction from critics and fans. All six films were nominated for or won Academy Awards, and were commercial successes, with a combined box office revenue of $4.38 billion, making Star Wars the fifth-highest-grossing film series. The series has spawned an extensive media franchise—the Expanded Universe—including books, television series, computer and video games, and comic books, resulting in significant development of the series’s fictional universe. Star Wars also holds a Guinness World Records title for the “Most successful film merchandising franchise.” In 2012, the total value of the Star Wars franchise was estimated at USD $30.7 billion (£19.51 billion), including box-office receipts as well as profits from their video games and DVD sales. In 2012, The Walt Disney Company acquired Lucasfilm for $4.05 billion and announced three new Star Wars films, with the first film, Star Wars: The Force Awakens, planned for release on December 18, 2015. 20th Century Fox retains the physical distribution rights to the first two Star Wars trilogies, owning permanent rights for the original 1977 film and holding the rights to Episodes I–III, V and VI until May 2020. The Walt Disney Studios owns digital distribution rights to all the Star Wars films, excluding A New Hope. The events depicted in Star Wars media take place in a fictional galaxy. Many species of alien creatures (often humanoid) are depicted. Robotic droids are also commonplace and are generally built to serve their owners. Space travel is common, and many planets in the galaxy are members of a Galactic Republic, later reorganized as the Galactic Empire. The Force allows users to perform various supernatural feats (such as telekinesis, clairvoyance, precognition, and mind control) and can amplify certain physical traits, such as speed and reflexes; these abilities vary between characters and can be improved through training. While the Force can be used for good, it has a dark side that, when pursued, imbues users with hatred, aggression, and malevolence. The film series began with Star Wars, released on May 25, 1977.Though the first film in the series was simply titled Star Wars, with its 1981 re-release it had the subtitle Episode IV: A New Hope added to remain consistent with its sequel, and to establish it as the middle chapter of a continuing saga. This was followed by two sequels: The Empire Strikes Back, released on May 21, 1980, and Return of the Jedi, released on May 25, 1983. The opening crawl of the sequels disclosed that they were numbered as “Episode V” and “Episode VI” respectively, though the films were generally advertised solely under their subtitles. In 1997, to correspond with the 20th anniversary of the original film, Lucas released a “Special Edition” of the Star Wars trilogy to theaters. The re-release featured alterations to the three films, primarily motivated by the improvement of CGI and other special effects technologies, which allowed visuals that were not possible to achieve at the time of the original filmmaking. Lucas continued to make changes to the films for subsequent releases, such as the first ever DVD release of the original trilogy on September 21, 2004, and the first ever Blu-ray release of all six films on September 16, 2011. Reception of the Special Edition was mixed, prompting petitions and fan edits to produce restored copies of the original trilogy. More than two decades after the release of the original film, the series continued with a prequel trilogy; consisting of Episode I: The Phantom Menace, released on May 19, 1999; Episode II: Attack of the Clones, released on May 16, 2002; and Episode III: Revenge of the Sith, released on May 19, 2005. On August 15, 2008, Star Wars: The Clone Wars was released theatrically as a lead-in to the animated TV series of the same name. Star Wars: The Force Awakens is scheduled for release on December 18, 2015. Aside from its well known science fictional technology, Star Wars features elements such as knighthood, chivalry, and princesses that are related to archetypes of the fantasy genre. The Star Wars world, unlike fantasy and science-fiction films that featured sleek and futuristic settings, was portrayed as dirty and grimy. Lucas’ vision of a “used future” was further popularized in the science fiction-horror films Alien, which was set on a dirty space freighter; Mad Max 2, which is set in a post-apocalyptic desert; and Blade Runner, which is set in a crumbling, dirty city of the future. Lucas made a conscious effort to parallel scenes and dialogue between films, and especially to parallel the journeys of Luke Skywalker with that of his father Anakin when making the prequels. Star Wars contains many themes of political science that mainly favor democracy over dictatorship. Political science has been an important element of Star Wars since the franchise first launched in 1977. The plot climax of Star Wars is modeled after the fall of the democratic Roman Republic and the formation of an empire. Star Wars also reflects on the events in America following the September 11 attacks. Some have drawn similarities between the rise in authoritarianism from around the beginning of Clone Wars until the end of the Old Republic and the United States government’s actions after 9/11, specifically passage of the Patriot Act in 2001. Previous Previous post: I can write a better film!